Is ConceptDraw DIAGRAM an Alternative to Microsoft Visio? I had been asked whether ConceptDraw is an alternative to Visio — I strongly believe YES. ConceptDraw is a useful diagram software that enables you to create sketches of functions, diagram and so on to visualize information and processes cost — and effort effectively. It provides a comprehensive set of features and tools to effortlessly represent and share any kind of concept, wireframe or structure on a smooth and easy way. It offers a set of vector drawing tools that can compete with any professional illustration program including Visio. Customizable grid and snap tool as well as the options to align shapes help to position your shapes precisely without a doubt better than Visio. Unlimited number of layers are supported — and these layers are easy to handle — it`s very similar to FreeHand — not as complicated as Visio — when I work with Visio I use the layers feature hardly ever, because it’s not user friendly. Lines stay linked to their shapes, so you don’t need to redraw your diagram every time you move something. Smart connectors can flow shapes around, display gaps or bridges where they cross other connectors. Really every shape can be turned into a shape with connectors. The automatic connection mode is also available. You can easily add connection points to any part of shapes or if needed to lines. Like Visio ConceptDraw goes with dozens of collections of shapes, but the utility is almost the same too — you have to create your own customized shapes. This is the next feature which is more user friendly than I know it of Visio. Most of shapes are able to contain text. ConceptDraw offers extensive formatting capabilities, and various tools for work with text, such as adding text to a shape, editing shape’s text and text searching, replacing, formatting and repositioning, adjusting shape’s size to fit its text and text auto-expand mode, choosing size, color and font of text; alignment, margins and text background color. All these features are almost the same like Visio apart from tabs. Quick-and-easy access to main tools and settings with customizable toolbars and floating dialogs. Concept Draw adheres to the What-You-See-Is-What-You-Get wysiwyg-principle and features anti-aliasing that brings your diagramming to a new level of presentation quality. I can give custom assets to every shape, add user defined context menus, and create links to other shapes, files or programs. ConceptDraw Basic scripts can be associated with shapes, providing virtually unlimited control over them.Concept Draw allows import and export files to a large number of raster, vector, multimedia and text formats, making it easy to exchange data with other applications. As far as I know Concept Draw is the only professional diagramming software that works on both Windows and Macintosh platforms. All its documents and libraries are absolutely compatible and can be exchanged comfortable between the platforms.As a freelancer I’ve worked always on both systems Mac and PC parallel — during the day with PC at the offices of my clients and with Mac in the evenings and during the weekends at home. But also in many agencies I saw both systems. Personally I prefer and I love Mac. (I work with Mac since 1985 — I bought my first own PC two years ago). I never recognized any significant or considerable differences between Mac and PC concerning the features. Normally I have a preference for Mac … but on the PC the Concept Draw interface is smaller and more “compact”. Generally I start with mind mapping before I build up flowcharts and wire frames or the story boarding. It is very important to me to stays in time and budget. I need a tool to plan and control the timeline and efforts. And for this Odessa offers a useful set of software. Figure 3: MS Visio 2016 diagram (VSDX file format) has been converted into ConceptDraw DIAGRAM diagram. MS Visio for Mac and Windows — ConceptDraw as an alternative to MS Visio. ConceptDraw DIAGRAM delivers full-functioned alternative to MS Visio. ConceptDraw DIAGRAM supports import of Visio files. ConceptDraw DIAGRAM supports flowcharting, swimlane, orgchart, project chart, mind map, decision tree, cause and effect, charts and graphs, and many other diagram types. This template shows the Venn Diagram. It was created in ConceptDraw DIAGRAM v12 diagramming and vector drawing software using the ready-to-use objects from the Venn Diagrams Solution from the "What is a Diagram" area of ConceptDraw Solution Park. Venn Diagrams visualize all possible logical intersections between several sets and are widely used in mathematics, logic, statistics, marketing, sociology, etc. 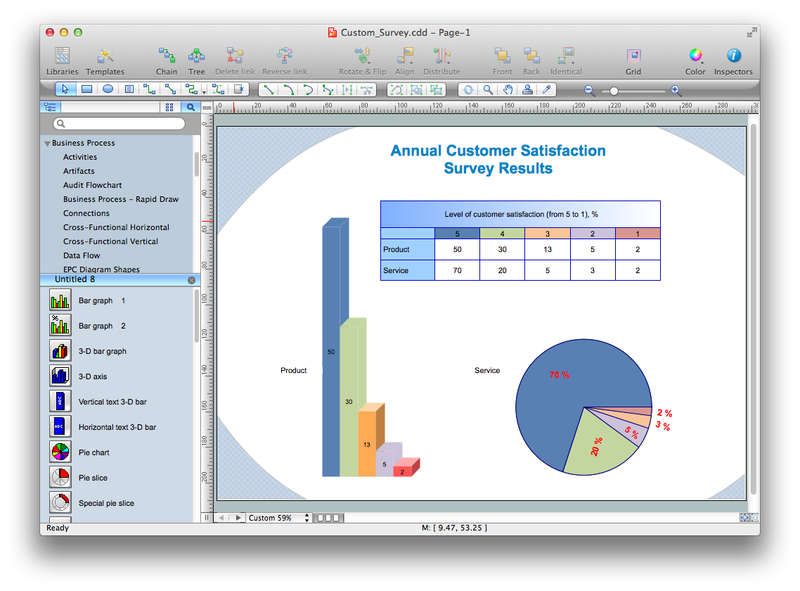 ConceptDraw DIAGRAM v12 is the world’s premier cross-platform business-diagramming tool. Many, who are looking for an alternative to Visio, are pleasantly surprised with how well they can integrate ConceptDraw DIAGRAM v12 into their existing processes. With tens of thousands of template objects, and an easy method for importing vital custom objects from existing Visio documents, ConceptDraw DIAGRAM v12 is a powerful tool for making extremely detailed diagrams, quickly and easily.